← Savage Garden – Black Black Heart. Savage Garden – Break Me Shake Me. Publicat pe 24 ianuarie 2015	de Cristi M.
In June, a fourth single, „Break Me Shake Me” was released in Australia as the album reached No. 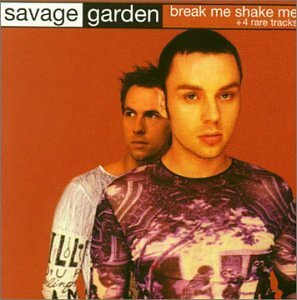 3 on the US Billboard 200 and was certified gold by RIAA.In September, Savage Garden won a record ten ARIA Awards from 13 nominations for the album and associated singles. They followed with their fifth Australian single, „Universe” in November. „Truly Madly Deeply” became their third US release and replaced Elton John’s „Candle in the Wind 1997”, after its 14-week run, at No. 1. In January 1998, „All Around Me”, was released as a radio only single in Australia, although about 3000 physical copies were given away at their second concert in Brisbane. By the end of the year, „Truly Madly Deeply” was the most-played song on US radio and the only one-sided single to spend a full year in the Top 30 of the Billboard Hot 100. In November, „Santa Monica”, the final single from the album, was released exclusively in Japan, accompanied by a video of a live performance at the Hard Rock Cafe. As of 2005, Savage Garden had been certified 12× platinum in Australia,7× platinum in the US,3× platinum in Canada, 2× platinum in New Zealand, Singapore, and in the UK.